As a part for delivering the technical support to all of PayPal’s merchant, PayPal providing the portal (located at: https://www.paypal-techsupport.com) for their merchant to communicate each other with PayPal such as discussing about the integration, send a feedback about the needed new feature, or any technical issue that could be face by PayPal’s merchant). In other side, for completing the support to all of entities that has use PayPal in their daily activity, PayPal also providing the site that could be used specifically by their customer to asking a permission about the use of PayPal’s logo at their business (located at: https://www.paypal-brandcentral.com). Both of site has been supported with the file upload feature so either merchant or customer could try to upload the permitted file that could be used by PayPal for looking the situation that faced by them each other. But the problem exists when those file upload feature has a validation issue at their content (for technical support portal) and at their file name (for brand central portal) that could allow the Attacker to be able to store a script (client side scripting) which could be used for few attack scenarios (like redirecting a user to a phishing page or even downloading a malware — which is called Cross Site Scripting — will explain later at this report). Additional Note: Previously, PayPal Brand Central Site has been open for public for registration and everyone could activate their selves with the activation link that provide by PayPal (and yes, we could bypass this activation and we will release the related simple paper in near future — you could try to test the forgot password feature first with account yk@paypal.com). But now, every registration at this portal should be approved manually by PayPal. To put it simply, this kind of vulnerability is a vulnerability that could “let” an Attacker to be able to execute a code in the input section that hasn’t implemented filtering for special characters such as “ > < : / ; etc. In contrast to Reflected XSS that doesn’t save the “script” and required the target to visit the URL that has been “injected” by “additional contents” from an Attacker, Stored XSS save this script at the database and could be execute automatically when the target visit the affected page like normal. At the TechSupport Portal, PayPal allows the users to submit their issue via “Contact Support” Feature that could be visit at https://www.paypal-techsupport.com/app/ask. Generally, there are two process that could be used to user to submit the ticket into the TechSupport portal, which are. 2.2.1. The user should login into their TechSupport Portal account and visit the mentioned URL related “Contact Support” Feature. At this condition, then the user will directly face the “Subject” column as the first thing that need to be filled. 2.2.2. The second one is the user just directly visit the “Contact Support” Feature without any login activity. At this condition, then the user will directly face the “Email Address” column as the first thing that need to be filled. At those ticket submission activity, the users can upload the supported documents that could be used to explains their issue more completely. In this situation, there are specific extension of the files that could be submitted by user, which are .txt, .doc, .docx, .xls, .xlsx, .pdf, .jpg, .png, .bmp, .ppt, and .pptx. In simple, .svg file format is not allowed by system to be upload at the portal. 2.3.1. The figure below shown the normal process of ticket submission at TechSupport Portal. In this case, the scenario is “Ticket submission with Login“. Everything looks normal just like the common flow of support portal. As has been described earlier, at those part, users are allow to upload the white list extension as their supported documents. 2.3.2. And the figure below also shown the process of ticket submission at TechSupport Portal with different condition. In this case, the scenario is “Ticket submission without Login“. So, at this part, the users should fill the email address that they would like to use to interact with the submitted ticket. After the question has been submitted, then the user itself should login into the portal to interact with their own question. As it has been described before, the security problem in this report is related with a vulnerability that “allows” an Attacker to be able to “store” an injected script (client side scripting) which could be used for few attack scenarios (like redirecting a user to a phishing page or even downloading a malware). The problem exist since there is avalidation issue at their content checking (for technical support portal) and at their file name (for brand central portal). This condition also supported with authorization issue at both of application. The proof of concept related this one is a little tricky since basically this XSS issue was a self-XSS. For completing the explanation, we do try to give simple mind map that could explain the attack method. So basically, we could use this authorization issue to create a new ticket and upload the malicious .svg file to trigger the XSS at the target. 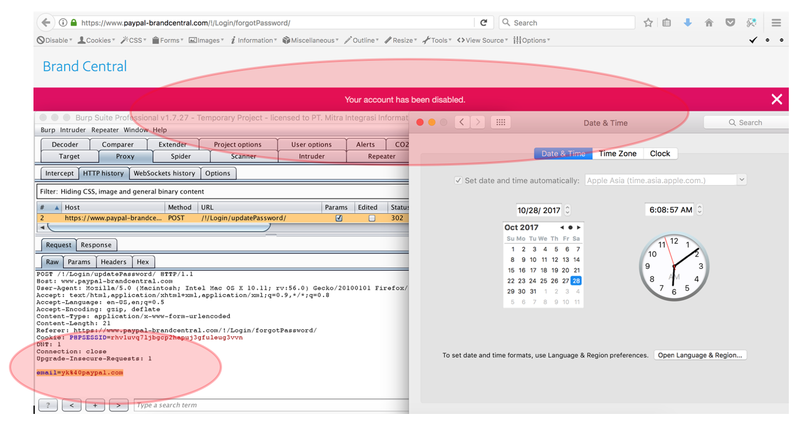 Since the kind of XSS is stored XSS, then the Attacker just need to wait until the target open the created ticket. Another interesting part is, since there is no CAPTCHA at this ticket submission feature, then the Attacker could automatically brute the email field with the list of emails that they want. (yes, there is a token that will expired in some of period, but at least we could use it). Note: Probably this method is one of the business process that has been thinking deeply by PayPal so they didn’t fix this kind of ticket submission method (All PayPal do is fixed the XSS problem). 4.1.2. At this step, we should learn the flow of the attack first before directly go to the proof of concept. The figure below shown the method that used by Attacker to tricks the victim. In this case, the Attacker should uses the process of “Ticket submission without Login” and “bypass the file upload protection” to upload the malicious .svg file. So, just like the flow of “ticket submission without login” part, the email address that should be fulfilled by Attacker is the existing victim’s email account at TechSupport Portal (see the point #4.1.1). Please kindly note, we still need to do a bypass of the client side protection that explained previously (see the figure below), then the Attacker should change the extension of the .svg file to the allowed one such as .png. 4.1.5. After everything was setup, then forward the request. When the request has been forwarded, then we will get a success result if the .SvG extension has been uploaded. 4.1.6. The latest part is of course the Attacker just need to wait the victim open the ticket and opening the .svg file that has been uploaded previously by Attacker. When the .svg file is open, then the XSS will be triggered. 4.2.1. Similar with the point #2.3.2 at this report, there is an authorization issue at this portal. In other words, any anonymous user could try to submit a ticket to the registered user at the portal. All they need just “know” the registered email ID. If the account doesn’t exist, then the registering process will stand as normal function (which is registration). 4.2.2. At this step, we will use the same flow just like the Technical Support Portal. The figure below shown the method that used by Attacker to tricks the victim. In this case, the Attacker should use the process of “Ticket submission without Login” and “upload any file name to be change later” to trigger the XSS. So, just like the flow of “ticket submission without login” part, the email address that should be fulfilled by Attacker is the existing victim’s email account at Brand Central Portal (see the point #4.2.1). So we should try to bypass it by changing the payload into this one. 4.2.4. The latest part is of course the Attacker just need to wait the victim open the ticket. When the ticket is open, then the page will execute the script that injected at the file name. 5.3. Checking the file name that uploaded into the server. 6.2. Stored XSS at Brand Central Portal: https://youtu.be/XwynfNOxIlI. 7.2. 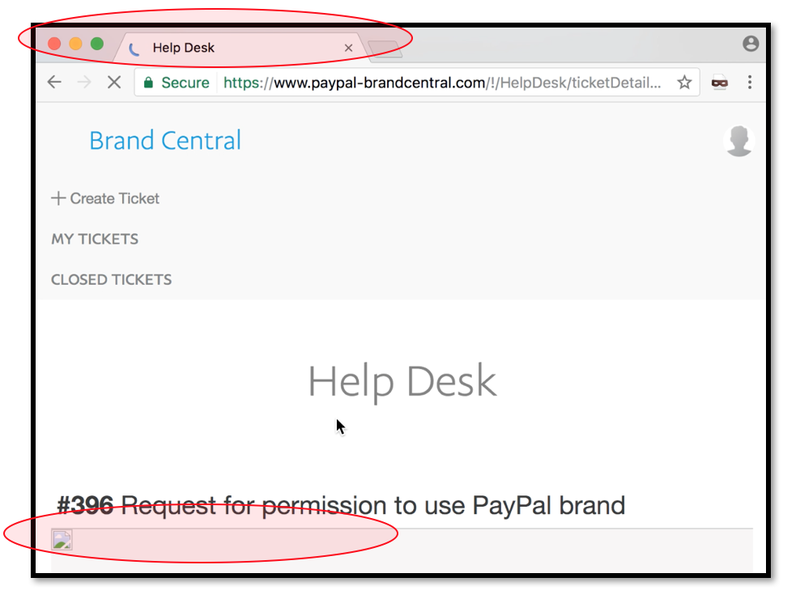 PayPal has rewarded the issue that reported at Technical Support Portal and decided to mark the issue at Brand Central as “Not Actionable”. The main issue at this situation is there is a lack of information that we sent to PayPal related the Brand Central (which is not with the mind map of process and mind map of Attack just like we did at the Technical Support Portal). My point of view in this case are: Since there are so much thing that should be protected, the Security Team doesn’t always know the process at each application that they have. Also, we should know if they will receive so many report from any researcher around the world. From both of those consideration, then the reporter always should create a complete report (explaining the process) or at least create the PoC video with the detail of step by step. 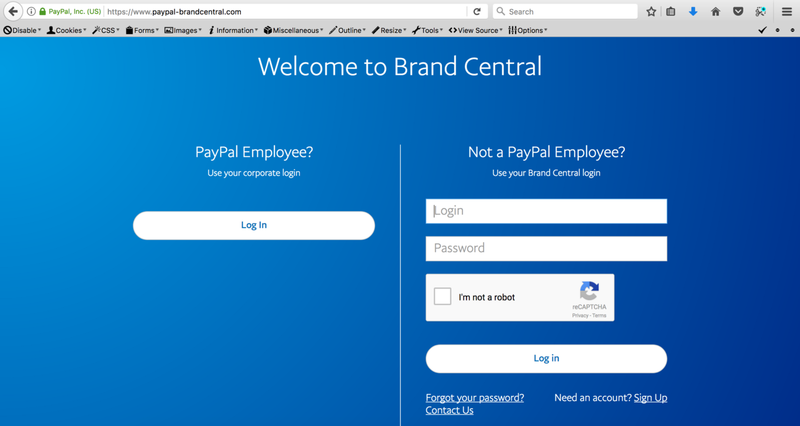 Please kindly note, since PayPal change the registration process at Brand Central, then the issue at Brand Central is not applicable anymore.